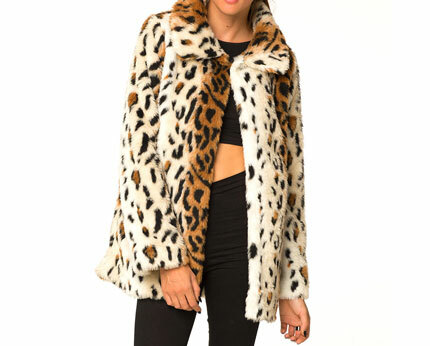 Faux fur is massive this season, and leopard is new print to be seen in. This jacket is an ideal wardrobe winter staple that could see you through until spring or beyond. Motel Fudge offer a faux fur classic coat that is perfect for wintery days, it will add a pop of colour to those dull and drab days and keep you smiling inside and out as it’s nice and snug to keep us lovely and warm on chilly days. This jacket follows the trend of faux fur that is a style that never dates, a jacket like this could last you years and never go out of fashion. When wearing a faux fur jacket you create a stylish classy vibe to your look, it’s perfect for sprucing up your everyday wear and also the ideal accomplishment to your evening wear on winter nights out. Follow celebs such as Kate Moss for inspiration on how to wear classic fur!